"This is a recipe for trotters passed down over time in my family. This was made every New Year's Eve to bring in the new year. A relatively inexpensive African-American dish. Very delicious! Serve with homemade potato salad, Southern style greens and candied yams and cornbread. It is even better the next day, and it freezes well. Serve sprinkled with a little more vinegar or hot sauce to taste." Thoroughly wash pig feet in cold water and place into a large pot or Dutch oven. Add celery, onion, vinegar, red pepper flakes, seasoned salt, garlic, black pepper, and bay leaves to the feet; pour in water to cover. Bring to a boil, reduce heat to low, and simmer until meat is tender and falling off the bones, about 2 hours. Delish!!! Will be making these more than just for New Years! I made it a week ago and my husband "not-easy-to-please" ask me to redo this recipe. He loves it. Just made these and ate the all of them in one meal. Will be making again, soon. Classic pigs feet recipe. I was happy to see the celery and vinegar. 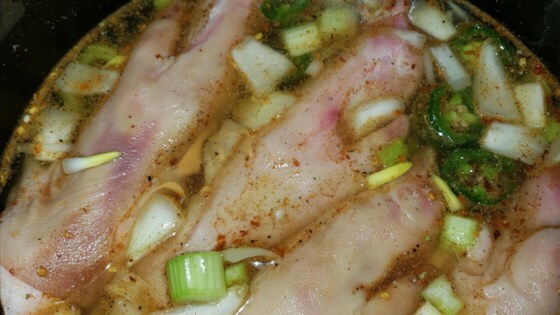 Cook this, classic pigs feet recipe at your next cookout and watch them disappear. Now a favorite recipe. Wouldn't change anything these are delicious!!!!! Thank you for this recipe.